The meetings, which will begin at 6:30 p.m. and conclude at approximately 8:30 p.m., will be held at Albany Technical College’s Kirkland Conference Center. The address for the meetings is 1704 S. Slappey Boulevard, Albany, GA 31701. 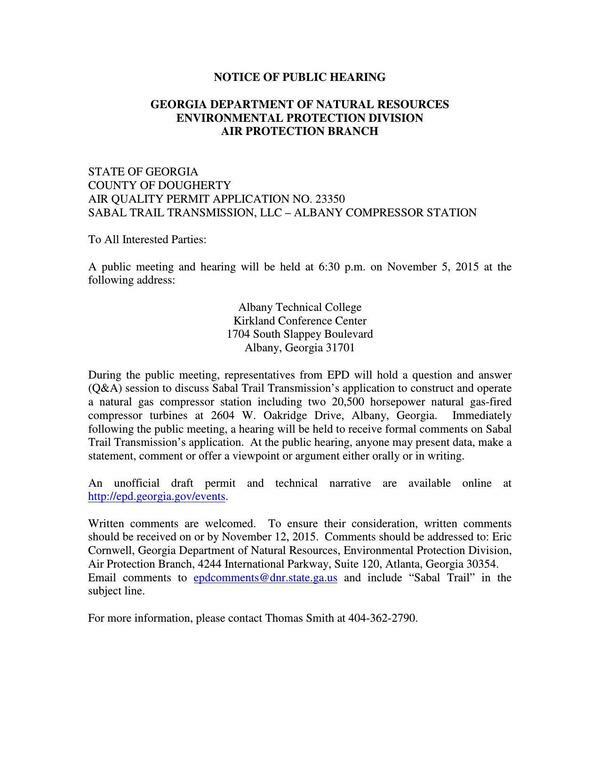 The purpose of the question and answer session is to present information and to answer questions about the air quality permitting review process for the proposed Sabal Trail Air Quality Operating Permit. EPD will follow the Q&A session with a public hearing to receive formal comments regarding the proposed permit application. 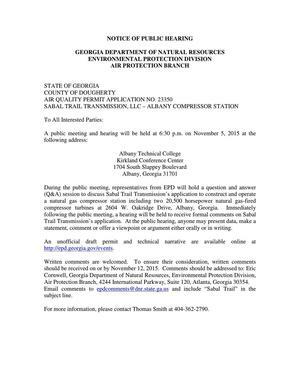 Via the permit application, Sabal Trail is seeking to construct a natural gas compressor station to serve the proposed pipeline. The compressor station would consist of two natural gas-fired turbines and ancillary equipment subject to air quality standards delegated to Georgia EPD. A copy of Sabal Trail’s permit application is available for inspection and review during the hours of 8:30 a.m. to 4:00 p.m., Monday through Friday, except official State holidays, at the Environmental Protection Division, Air Protection Branch, 4244 International Parkway, Suite 120, Atlanta, Georgia. Comments regarding this permit application are due by November 12. Please include “Sabal Trail Air Quality Permit Application” in the subject line. For information on Title V and/or the review process, please contact Eric Cornwell, 404-363-7020, or Dika Kuoh, 404-363-7143. For information about the Q&A session and public hearing, please contact Thomas Smith, 404-362-2790.